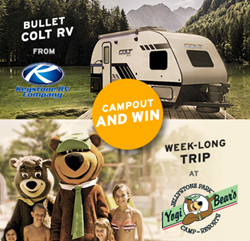 Campaign encourages camping and offers a chance to win a Bullet Colt RV or week-long park stay and high-value gift card. By supporting the Great American Campout, we are ensuring our wildlife and natural habitats are protected for generations of RVers to come. RV Trader recently partnered with Keystone RV, Yogi-Bear’s Jellystone Park Camp-Resorts and the National Wildlife Federation to support the 13th annual Great American Campout™. Jeff Probst, famed host and executive producer of the long-running hit TV show “Survivor” will be the campaign’s 2017 spokesperson. The campaign, running until the end of October, enters anyone who pledges to camp a chance to win one of two high-value prizes - either a Bullet Colt RV worth $18,000 or a week-long stay at a Jellystone Park™ with a $500 travel expense voucher and a $250 Jellystone Park™ gift card. As an additional enhancement, the National Wildlife Federation’s Trees for Wildlife™ program will plant 5,000 specially donated, native trees to bolster preservation efforts if 150,000 people pledge to camp. While the Great American Campout™ campaign spans a six-month period, the partners are encouraging individuals to take part in the Great American Campout Day on June 24. Great American Campout Day is part of June’s Great Outdoors Month, and is meant to build awareness of ways to protect our nation’s wildlife and the places they call home. Are you ready to pledge to camp? Visit http://www.nwf.org/campout to sign up. Those who make the pledge will gain access to the National Wildlife Federation’s full resource page full of camping tips, prize information, Great American Campout™ event directories, and more. RV Trader is the premier online classifieds site for buying and selling recreational vehicles. With over 165,000 new and pre-owned units for sale by dealers and private sellers across the country, RV Trader attracts millions of active buyers every month who visit the site in search of their next unit. To help sellers capitalize on this targeted audience, RV Trader offers a comprehensive suite of digital marketing solutions to help advertise RVs for sale to active buyers across all devices. The mission of the National Wildlife Federation, America's largest wildlife conservation and education 501(c)(3) non-profit organization, is "uniting all Americans to ensure wildlife thrive in a rapidly-changing world." For over 80 years, the National Wildlife Federation has worked to connect people with nature, to protect wildlife and wild places, to inspire children through Ranger Rick magazine, and to help parents, educators, and youth group leaders find new ways to engage children with the wonders of wildlife. http://www.NWF.org. Being one of the largest manufacturers of towable RVs in North America means Keystone can offer more quality features for your money than any other brand on the market. It also means options are never in short supply – from ultra-lightweight trailers to luxurious fifth wheels. With 1,000 locations across the United States and Canada, you are never far from a Keystone dealer. http://www.KeystoneRV.com. Launched in 1969, the Jellystone Park™ system is the second largest chain of campgrounds in the United States, boasting 80 campgrounds with more than 17,000 campsites and vacation rentals in 31 states and four Canadian provinces. Its Camp-Resorts are among the best campgrounds in the industry with a quality reputation for being fun, friendly, clean and service-oriented parks. Additionally, each Jellystone Park™ is themed with Yogi Bear™ elements providing instant recognition and consumer appeal. It is truly a place "Where You Camp with Friends. "® Yogi Bear's Jellystone Park™ Camp-Resorts are franchised through Leisure Systems, Inc. (LSI), a wholly-owned subsidiary of The Park River Corporation, Cincinnati, Ohio. For more information, visit http://www.campjellystone.com.